Twinkling on the ends of brass stemmed arms, floating weightlessly above heads, the sputnik chandelier is a fixture of awe. With varieties that span shape, articulation, hue, and mass, the sputnik has survived due to its manipulations in modern design. It can effortlessly fit into any period, style, and design. This adored atomic space age fixture was born around the time of a cataclysmic inspiration. 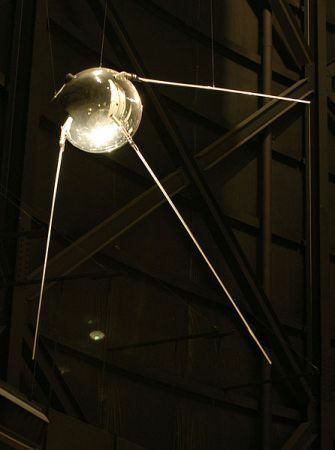 On the 4th of October, 1957 the Soviet Union launched Sputnik 1- their spherical, antenna adorned testament to scientific superiority into the vast unknown. Not only did this innovation trigger the Space Race and the nudge the Cold War into its murky existence, but modern design changed forever as well. One of the most well known manufacturers of sputnik lights was Lightolier. Interestingly enough, they were already producing the chandeliers that would later be known as “sputnik” lamps three years before the launch of Sputnik 1. The sputnik lamp is an illustrious example of human thought with its conceptual birth taking place nations away and years apart.